Saxophone player, composer, pianist, singer, politically committed poet, playwright, Archie Shepp is a legend. 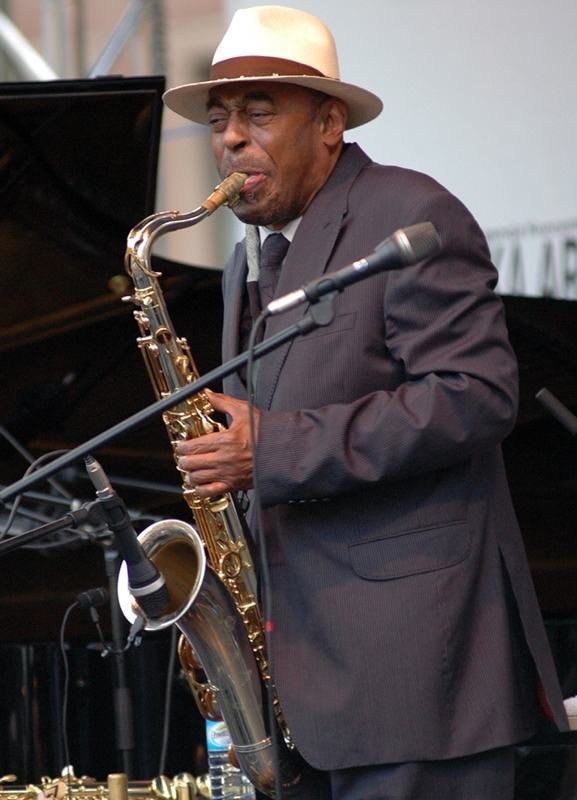 Archie Shepp was born in 1937 in Fort Lauderdale in Florida. He grew up in Philadelphia, studied piano and saxophone and attended high school in Germantown ; he went to college, became involved with theatre , met writers and poets, among them, Leroy Jones and wrote : « The Communist », an allegorical play about the situation of black Americans . In the late fifties, Archie Shepp also met the most radical musicians of the time : Lee Morgan, Bobby Timmons, Jimmy Garrisson, Ted Curson, Beaver Harris… his political consciousness found an expression in plays and theatrical productions which barely allowed him to make a living. In the beginning sixties he met Cecil Taylor and did two recordings with him which were determining. In 1962 he signed his first record with Bill Dixon as co-leader. During the following year, he created the New York Contemporary Five with John Tchichai, made four records for Fontana, Storyville and Savoy and travelled to Europe with this group. Starting in August 1964, he worked with Impulse and made 17 records among which, Four For Trane, Fire Music, and Mama Too Tight, some of the classics of Free Music. His collaboration with John Coltrane materialized further with Ascension in 1965, a real turning point in Avant-Garde music. His militancy was evidenced by his participation in the creation of the Composers Guild with Paul and Carla Bley , Sun RA, Roswell Rudd and Cecil Taylor. In July 1969 he went for the first time to Africa for the Pan African Festival in Algiers where many black American militants were living. On this occasion he recorded Live for Byg the first of six albums in the Actual series. In 1969 he began teaching Ethnomusicology at the University of Amherst, Massachusetts; at the same time he continued to travel around the world while continuing to express his identity as an African American musician. He populates his musical world with themes and stylistic elements provided by the greatest voices of jazz: from Ellington to Monk and Mingus, from Parker to Siver and Taylor. His technical and emotional capacity enables him to integrate the varied elements inherited by the Masters of Tenor from Webster to Coltrane into his own playing but according to his very own combination : the wild raspiness of his attacks, his massive sound sculpted by a vibrato mastered in all ranges, his phrases carried to breathlessness, his abrupt level changes , the intensity of his tempos but also the velvety tenderness woven into a ballad. His play consistently deepens the spirit of the two faces of the original black American music: blues and spirituals. His work with classics and with his own compositions (Bessie Smith’s Black Water Blues or Mama Rose) contributes to maintaining alive the power of strangeness of these two musics in relationship to European music and expresses itself in a unique mix of wounded violence and age-old nostalgia. The scope of his work which registered in the eighties a certain urgency (at the cost of a few discrepancies) is a witness to the fact that in 1988 Archie Shepp was with Sonny Rollins one of the best interpreters in the babelian history of jazz. With his freedom loving sensitivity Archie Shepp has made an inestimable contribution to the gathering, the publicizing and the inventing of jazz.